is this (part of) the Bonnaroo 2016 lineup? 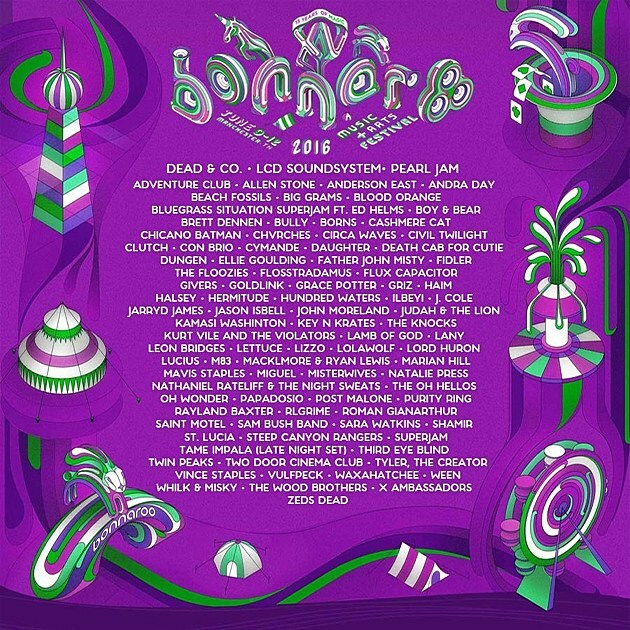 Last night, the Bonnaroo 2016 lineup briefly leaked on the Bonnaroo app (part of it at least), and it was quickly taken down but not before someone could grab it put it on Reddit. A commenter suggests it’s just the first wave, and the artists listed as headliners — (Grateful) Dead & Co., LCD Soundsystem and Pearl Jam — are just speculated headliners. (The poster also has misspellings like “Fidler.”) The rest is listed in alphabetical order, and includes Big Grams, Blood Orange, Bully, Clutch, Death Cab for Cutie, Dungen, Father John Misty, Jason Isbell, Kamasi Washingotn, Kurt Vile, Lamb of God, Leon Bridges, M83, Mavis Staples, Miguel, Purity Ring, Shamir, Tame Impala, Vince Staples, Waxahatchee, Ween and more. For the first time, Great State Park, home of Bonnaroo, will now feature its own permanent water line, allowing for the installation of more than 400 permanent toilets (38% of the total toilets onsite will be flushable), hundreds of permanent shower stalls (35% of the total shower stalls onsite), and a large number of water filling stations newly installed throughout the site. More improvements for the 2017 festival are being planned too. Tickets go on sale January 22 at noon EST.